I have some fun and bright nail art to share with you today. These simple lines and dots can be created with any color. But I am trying to coax Spring from its hiding spot. I used a base color of OPI I Just Can't Cope-acabana, which is a bright and sunny yellow. Then, I used Fly (a gorgeous teal blue) and Strawberry Margarita (a vibrant strawberry pink). I didn't really start out with a plan - it just seemed to take shape as I went. Sometimes that really works out for me. These colors are great together for nail art. I didn't use tape to create the lines. Sometimes I do, but it just seems to take forever - and I have decided that no one gets as close to my nails as the camera. So I am not worried about small imperfections. Although the tape does create a cleaner line. What kind of Spring nail art are you wearing? This polish was purchase by me. All opinions are my own. LOVE those colors together :) So bright and cheerful. I love this mani so much!! Brights are my favorite. I love the Brazil collection! 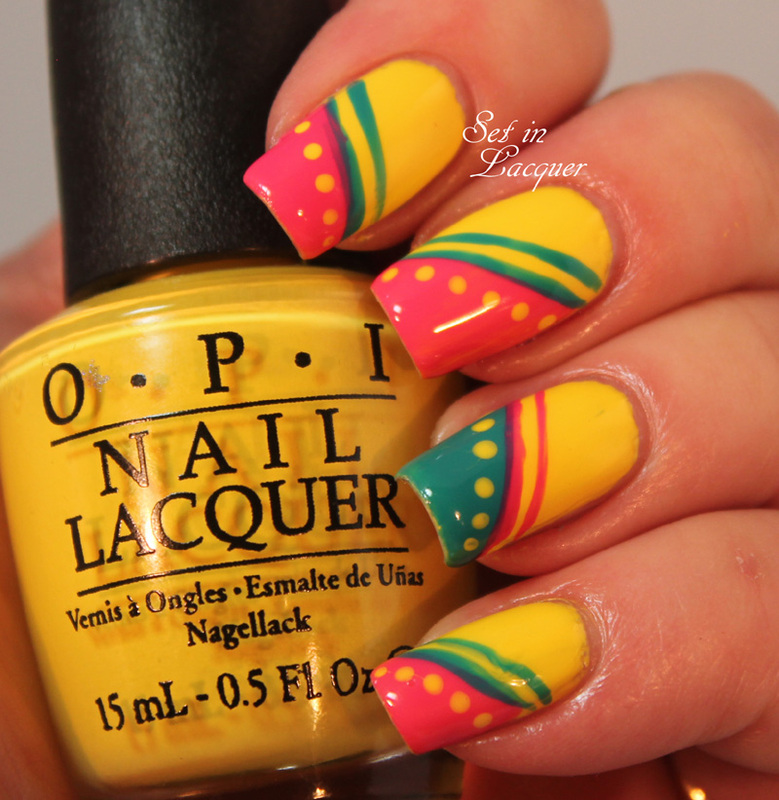 This is hands down the most cheerful Mani ever!! Gorgeous colors together. Makes me smile and think of vacation!!! Love it. SO CUTE! I love the design and color! WOW. Really digging the design, so fun! Every nail art you feature makes me drool. Wish I can do this perfectly. I blame my shaky hands, no I blame my coffee addiction for these shaky hands! How fun! I love the brights. Fantastic design. Love the colors. Gorgeous! Love the design...so bright and poppy. This makes me scream SUMMER in my head! Love it! Soooo pretty - you did a fantastic job! Lol, love this off-the-wall design! Something like that, for me, would entail an all-day session! And not be nearly as much fun, either in the execution or the final look. I'd have to break out the tape and would lose the primitive art look that makes your design sing. Very colourful. I like it. That is so cute! I would never have the patience!! This is so fun and summery!